Know promote public awareness and study of WA wildflowers. Grow promote the cultivation of WA wildflowers in gardens and public spaces. Conserve promote the conservation and preservation of WA wildflowers and bushland. There will be two levels of funding. Small Grants: Small Grants up to $2,000: awarded each year and administered by the Society Management Committee, with a maximum of $2,000 per year. Large Grants: Large Grants $2,000 to $20,000: On a biennial basis with maximum of $36,000 available for the two years. Large grants will be awarded by the Society Management Committee, on the recommendations of Mary Bremner Bequest Fund Assessment Panel. Society applicants can be: a group of three (3) or more members of the Society; Society’s Branches; and Society’s Management Committee Sub-committees. Applicants from incorporated groups (with at least one Society member involved). Applications from like-minded groups are permissible and encouraged. Suitable applicant groups include kindred groups and educational groups (schools, universities etc.). All applicant groups can discuss their proposal with a designated Society Management Committee member prior to submitting their application. The aim is to support the receipt of relevant applications for the Assessment Panel to consider. Applications for Grants will open on the day of the Society State Conference and AGM of each year for Small Grants and every second year for Large Grants. Applications for Grants will close on 1 October of the same year to allow for a response to a notice in the Society’s August Newsletter. Grants will be awarded in December and run from 30 December to 30 December, over one year for Small Grants and two years for Large Grants. In the case of Small Grants, if the maximum allocated under the Small Grants Program is not allocated by the date set in early December the uncommitted monies will be available through application to the Management Committee until the end of the Society Financial Year. Small Grants will be available in full at the commencement of the project. Large Grants will receive 50% on commencement of the project and 50% on acquittal of the project. Acquittal of the grant will be deemed successful on lodging of financials with a brief report on the project together with – a presentation of a verbal report on the funded project at the Society AGM and/or a Branch Meeting and an article on the project in the Society’s Newsletter/website. • Incorporated, volunteer community groups with at least one Society member. • Society members (collectively three (3) or more). • Non-incorporated community groups. These often small groups can seek a relevant or similar incorporated group to sponsor or partner in the grant application. • Society (or other group) operational overheads/administration, that are funded through membership fees. • Equipment/ prizes/ venue hire. • Payment of presenters, writers, facilitators etc. • Payment of a person’s time to organise the event (no more than 15% of grant request). • Materials, accommodation, travel costs. • A project, activity or event that: is based in Western Australia and focused on WA flora; promotes WA native flora to the public; promotes ecosystem functions and WA native flora as part of the environment; preserves or protects WA native flora; surveys, records and documents WA native flora; facilitates the production of pamphlets, paintings, photos, films, online resources etc. 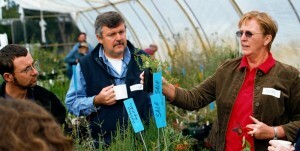 on WA native flora; provides walks or tours for members and the public; provides talks, workshops or information sessions on knowing, growing, promoting and preserving WA native flora; undertakes to display and/or non-commercial sale or provision of WA native flora; and/or teaches propagation techniques of WA native flora. • Art and photographic exhibitions with a WA native flora theme. • Projects on public land that has the appropriate permission from the relevant authority. Applications will be regarded highly when there is a: focus on community participation; matching financial co-contribution; and partnership with kindred organisations and are under pinned by an agreement outlining rights and responsibilities of each party. When applications receive a matching score in the assessment matrix process, the application that involves Society members (volunteers) will be given priority and awarded the grant. • Environmental work on private land that provides financial benefit to an individual. • Overhead and recurrent costs of the organisation applying for funds. • Rent and cost of administrative equipment/resources. • Payment of staff not associated with the project. • A project not based in Western Australia. • Total/sole funding of “general” land care activities that are eligible for federal, state and local government funding e.g. weed control and fencing. • Requests for recurrent/repeat funding for the same project without objective evidence of meeting the original application goals and outcomes. Grant applications open at the AGM and will close on 1 October 2017. Contact the Society Office to express an interest and/or obtain an application form. Grants will be awarded in December and run from 30 December to 30 December, over one year for Small Grants and two years for Large Grants. Further details of the day-to-day management of the Mary Bremner Grant Programme for Society Members can be found in the Members Only section here.